I plugged in the charger from note 4 that has fast charging. On my s6 edge plus It shows as cable charging only. I plugged the charger back into my note 4 and fast charging comes up with no issue. Any idea is there a setting I'm missing. This is T-Mobile variant by way. I don't have a Note 4 charger, but fast charging is working fine with the included fast charger and cable on my S6 Edge+. Does fast charging work with your included charger, or is it just the Note 4 charger that's not working? I used the included charger and still no fast charging. 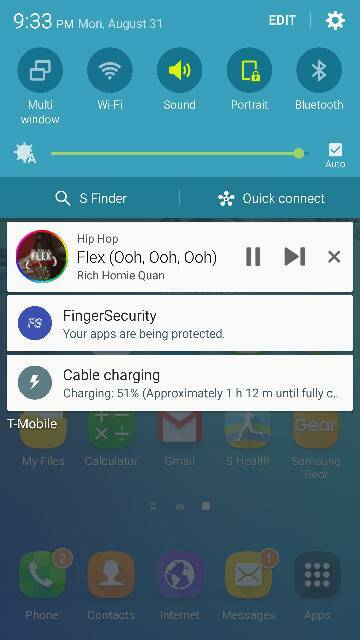 I plugged the the included charger into my note 4 and fast charging appeared in the notification screen. Looks like I got a defective unit going to go to T-Mobile to get it replaced. I also am having this problem. I am using the charger/cable that came with my s6 edge+, and fast charging does not seem to be working. After the wireless charging didn't work (again) last night, I plugged it into the stock charger. It was at 61%, and said it had 2hrs 13 min to a full charge. I noticed yesterday morning that it seemed to be charging very slowly too, after I had to plug it in to the regular charger. And btw, for wireless charging, does this phone work onlywith the Samsung wireless charger? Did you exchange the phone that wasn't working, and does the new one work? Mine did something similar this morning... plugged it into the charger that it came with and just said cable charging and charged slow. So I plugged it into my girlfriends s6e regular model charger and it said fast charging .... there seems to be alot of glitches with this charging system.... I'm taking mine back this weekend and exchanging it for another one. This is getting ridoculous. I think I'm going to have to take mine in to the AT&T store. If they can determine that it's just the charger, I'll be fine if they give me a new charger, but if not, I'm going to exchange the phone for another one. I'm exchanging regardless. The very charger it came with in the box is showing as cable charging and slow charging. I tried mine with my husband's s6 charging cord (that came with his phone), and fast charging doesn't work with that either, so I'm going to exchange the phone tonight. I'm halfway tempted to just exchange it for the Note 5 because I haven't read about any charging problems with that, but I really like the s6 edge+ except for the charging issue. I also am having trouble with it charging with either of my (non-Samsung) wireless chargers. My Note 4 with the S-view wireless charging cover worked fine with both of those chargers. The fast charging seems to work fine in mine. However, the wireless charger the BestBuy offerred (note the latest Samsung Fast Wireless Charger) doesn't seem to work after first 5-10 minutes. It made me mad. I went and got it exchanged and it still doesn't work. Shipping it back to Samsung for further analysis. Hm. Odd. When I opened the phone and charged for the first time.. It was fast charging.. Now that I just checked it again, doesn't do fast charging. However, I know this sounds stupid but depending on your wall outlet, will affect the charge. Especially if you're plugged into a surge protector. I use wireless charging so I'm not to worries about fast charging. So far, my Edge+ is fast charging just fine with the included charger and with a cheap fast charger I bought for my car. I have a wireless fast charger on order, so we'll see how that works when it arrives. I am also experiencing annoying issues with the charging status, for sometimes it reads "Cable Charging" instead of "Fast Charging." I often just disconnect the device, and switch the charger to another port. That usually does the trick, but I am starting to get annoyed with this issue. Coming from my previous iPhone 6 Plus, I am finding that the USB charging port does feel a bit more flimsy, in comparison to the lightning port so I am taking extra caution not to damage it by blindly jamming the charger in. There really is no rhyme or reason for it to do this. Sometimes I'll plug it in and it will say cable charging I unplug and re plug 2 or 3 times and on the 3rd time it will say fast charging. It's definitely inconsistent and a pain in the ***! fruit2droid and cellomj like this. I had these issues with my G6 at first. I have two fast charges and the provided cables would only detect fast charing 1/3 of the time. Try a different cable and see if that helps. I no longer get have the issue. It was frustrating that the OEM cables had problems. I just told t mobile employee s it happens randomly which it does and that samsung support told me to exchange and they did exchange for me. When I told the tmobile guy that those wireless chargers don't work either he said yes they do and took his personal s6e plus out of his pocket and put it on one and it went into a charging to charging paused loop and that sealed the deal amd he thanked me for letting him know so he could exchange his lol. My new one showed fast charging when I put it on charger tonight using the oem charger in the same wall socket my old one would only cable charge out of. I began having that issue and instead of plugging it into the surge protector with a ton of other things i then plugged the stock rapid charger into the wall and it fast charged with no problems. Hmm, just started having the same issue. Using the stock s6e+ cable and charger. I have to reconnect several times to get the fast charge. Hi all, I had this issue for a long time, ever since I got my S6 Edge Plus on release day. I never took it back because randomly it seemed to work. As someone previously mentioned, if it works in the store, you'll take a lot of crap before they'll return it. In any case, strangely enough, If hit the background app button and then "close all" of the background apps, then plug it in, it will fast charge. This is the stupid problem to have... but that's been a fairly reliable workaround in my case. Hope it helps! I recently updated my edge + since i got the notification for system update, when the phone was done with reboot, I charged it and showed cable charging only. Called customer service, was advised to restart phone, and then it was fixed, it shows fast charging now, however, after a few minutes it showed cable charging again. Tried different wall plugs but still the same thing until i decided to change the cable, that did the trick.. shame on the cable thats less than 1 month old compared to the one im using now which is a year old..
Screen doesn't light up with notifications? How to pair picture with text?